Just missed . . . Bounced off . . .
Late yesterday night in Gongbei, Zhuhai, I saw several boys playing a game of Gongbei-ball. I made up the name, and the game's rules appeared to evolve over time. The main piece of equipment was paper crumpled up and taped into a ball. The boys granted me a throw. I must say, it was a pretty good ball. 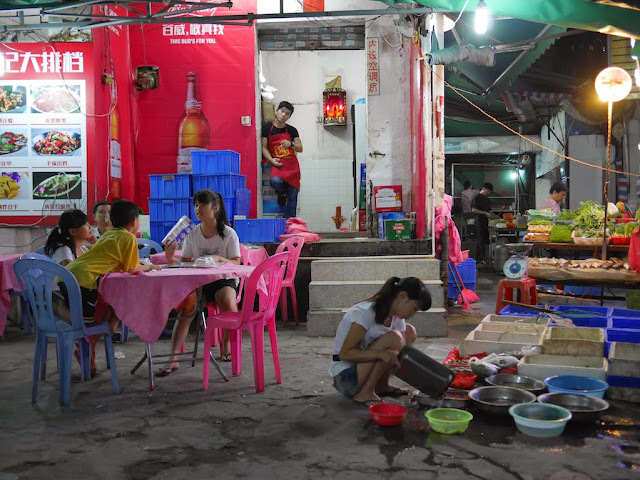 The narrow street could easily be labeled as an alley in today's Zhuhai. 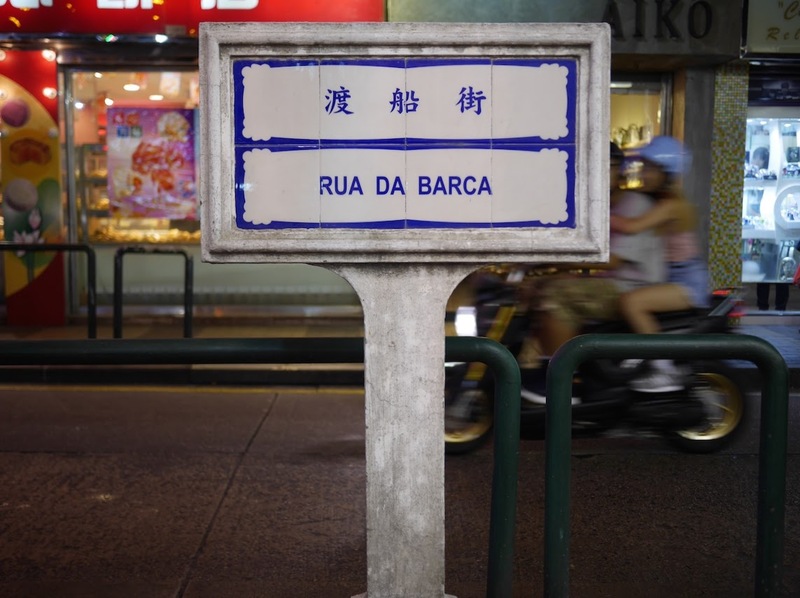 If you want to find Gaosha Middle Street (高沙中街), as it is identified on posted signs there, good luck. Several online maps give it a different name or no name at all. 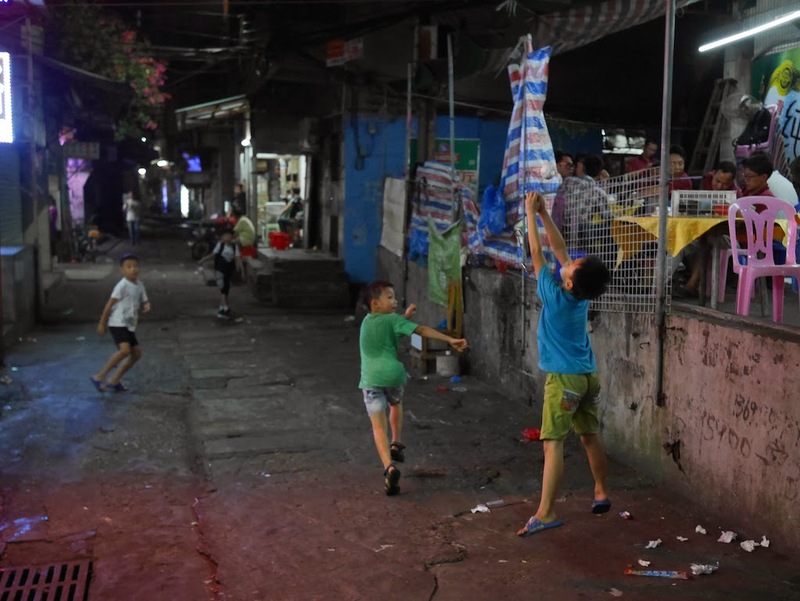 But these kids know where the street is. And it is full of life even at night. 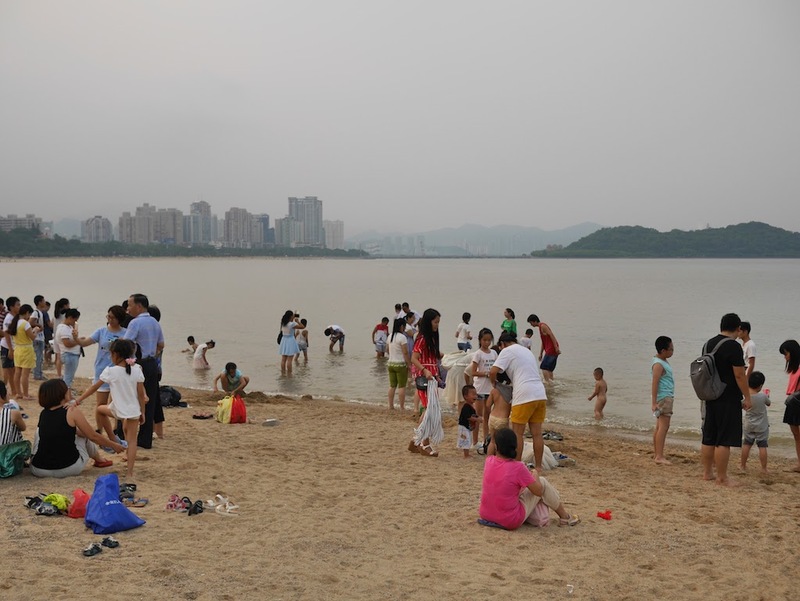 Most of the time I see photos of China's beaches in the news, they either feature incredibly dense crowds or people wearing facekinis. 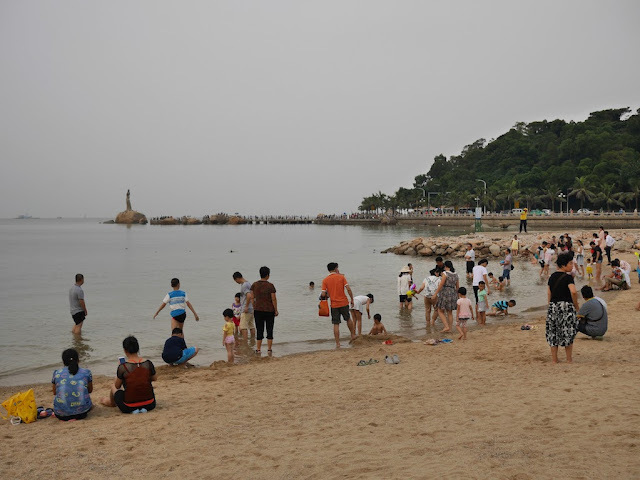 So here are two photos from a small beach across the road from Haibin Park in Zhuhai which show an everyday side which may look a bit more familiar to people outside of China. 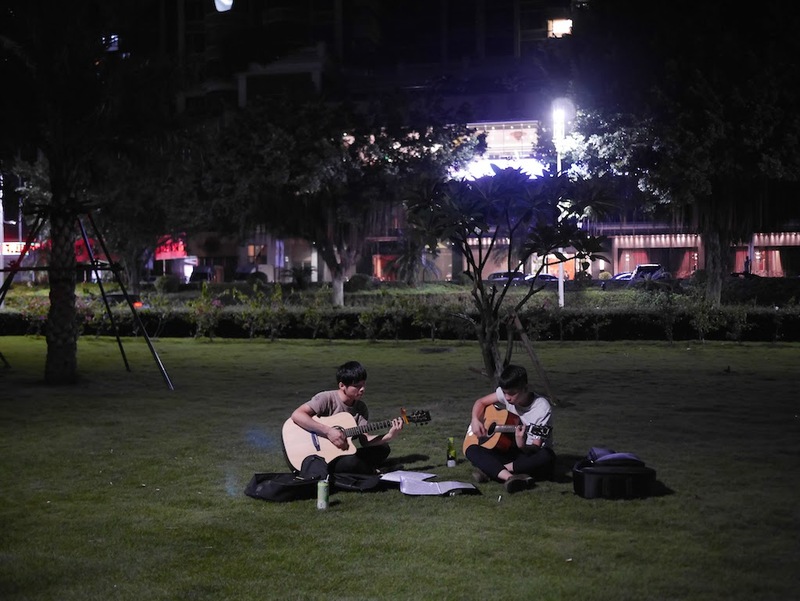 The beach's location makes it convenient for a quick stop between other popular activities. The beach affords views of Zhuhai's iconic Fisher Girl Statue (in the background of the first photo) and an urban area of the Xiangzhou district (in the background of the second photo). And Jingshan Park, previously featured here, is an easy walk away. On this day some people likely welcomed the overcast sky since they would not need to worry about getting a tan. No facekinis, which raise more questions about burkini bans in France, were needed. 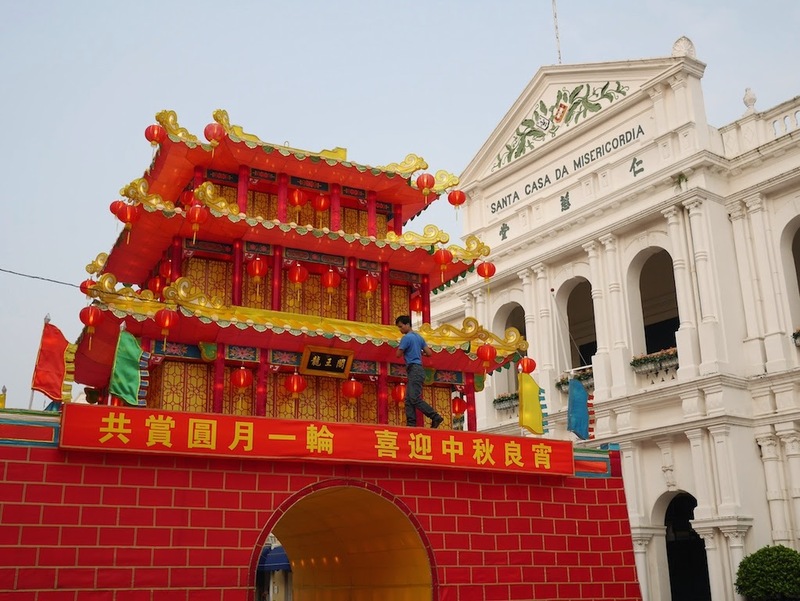 In past years I have shared Mid-Autumn Festival scenes in Macau from locations such as Taipa Village, Portas do Cerco, and Largo do Senado. Mid-Autumn Festival isn't until September 15 this year, but signs of preparation for the holiday are already visible, such as in Largo do Senado. In addition to lanterns, mooncakes are a popular way to celebrate the holiday. 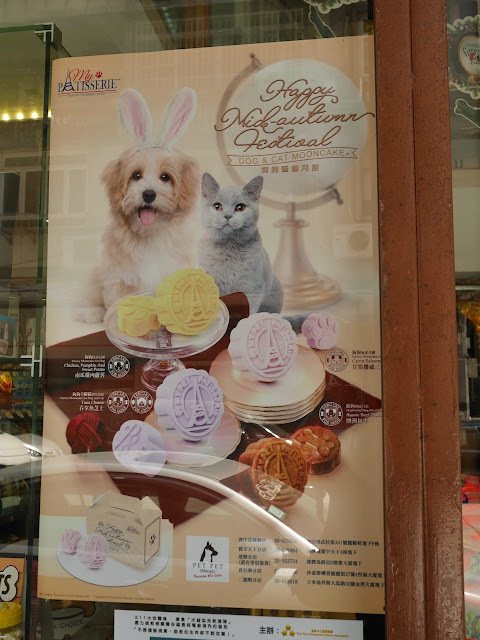 I saw a sign in Macau indicating that they won't be restricted to only humans. Although they perhaps aren't a familiar aspect of the holiday to many in China, pet mooncakes aren't a new thing and other brands are out there. Mooncake flavors listed on this sign include carrot salmon, Aussie beef flavor, tuna cheese, and chicken, pumpkin & sweet potato. All are listed as acceptable for dogs. Only the the tuna cheese is listed as cat friendly. I don't know what will happen if you try to give a carrot salmon mooncake to a cat. I also don't know if a human would like them. 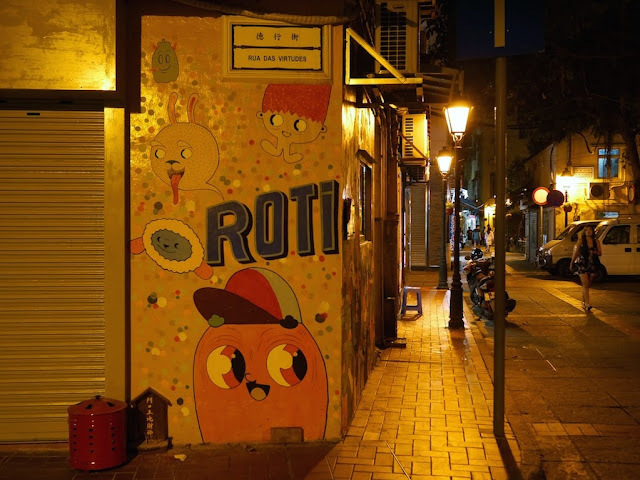 People may want to take extra care when selecting which box of mooncakes to regift. As recents posts here and here indicate, I am no longer in Taiyuan, and have most recently been in Zhuhai and Macau far to the south. 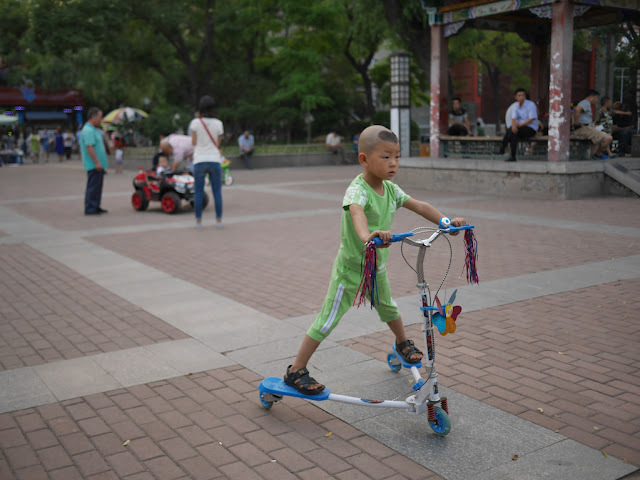 Leaving Taiyuan proved to be more challenging than I had expected. After I told the person at the Taiyuan Wusu International Airport check-in counter my destination, she asked "What time?" with a tone voice indicating something wasn't quite right. My flight had been canceled. C'est la vie. Long story short, it made more sense for me to take the flight at the same time the next day than taking a flight much later than same day which I believed had a good chance of being delayed. Fortunately, Taiyuan's airport isn't very far from the city center. Soon the staff of the hotel where I had been staying was surprised to see me again, and I was taking advantage of the opportunity to do / eat a bit more in Taiyuan. When I arrived at the airport the next morning, all was fine except I was hungry. 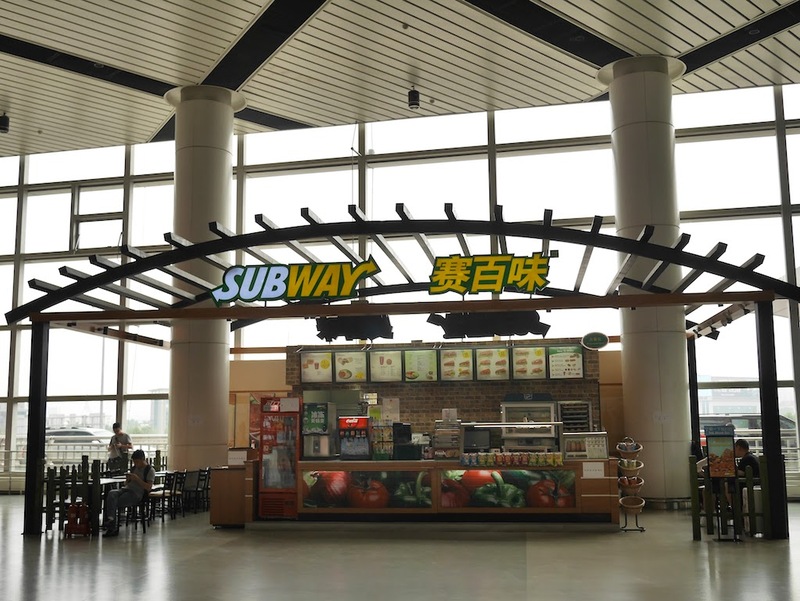 At an airport in a city such as Taiyuan, I would expect to find restaurants serving overpriced and / or unexciting Chinese food and KFC. But the Taiyuan airport offered a changed of pace. I didn't expect Subway to be my last meal in Taiyuan. Admittedly, it wasn't my first sandwich in Taiyuan, but this one didn't have donkey meat. A return to a familiar place . . . I am going to follow the spirit of a sign I saw today and keep things low key here. If I see this sign for sale, I will be tempted to buy the whole set. 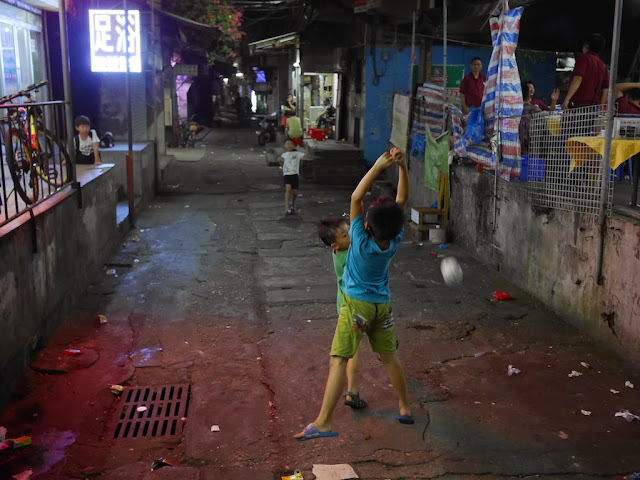 In response, some Chinese sports brands are "looking for foreign assistance". I saw one potentially relevant example in Taiyuan, Shanxi province, although I don't think it is what Einhorn had in mind. 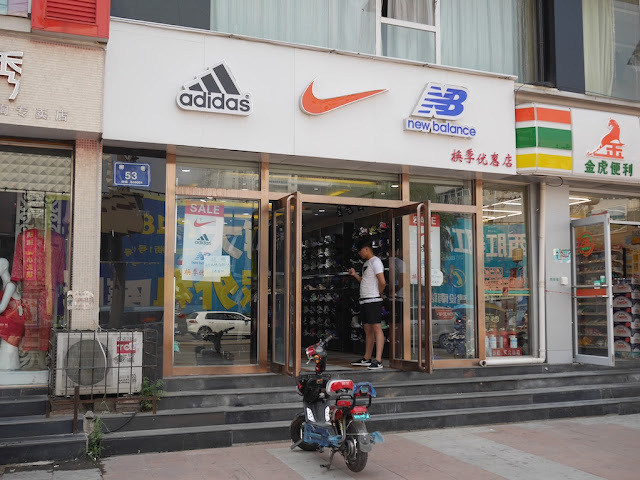 One could ask whether the store in Taiyuan sells genuine Adidas, Nike, and New Balance shoes. I did not ask this question. Instead, I took the photo simply because I wanted a recent example of the Adidas three bar logo. So simple. So recognizable. 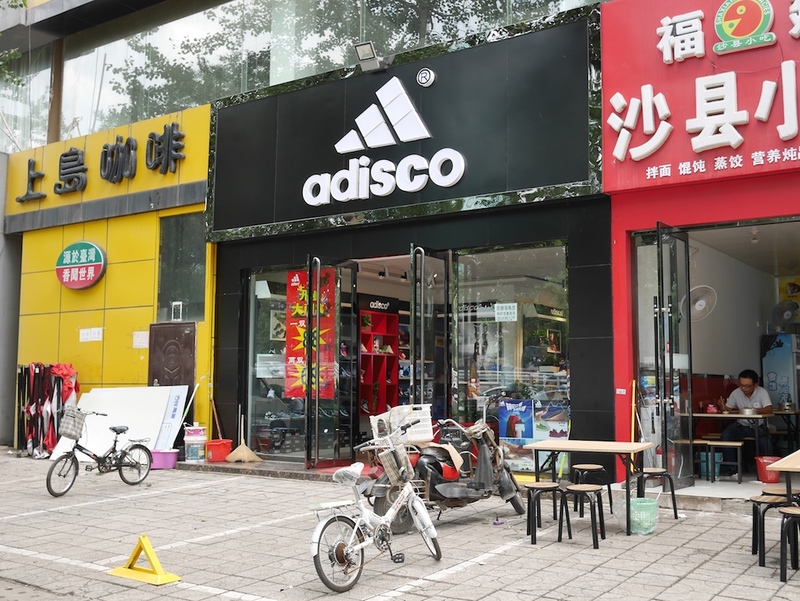 As I assume most readers immediately noticed, Adisco's logo, indicated as registered, is rather similar to the Adidas three bar logo. One difference is that two of the bars are subtly divided into smaller sections. Adisco's shoes display a similar approach. 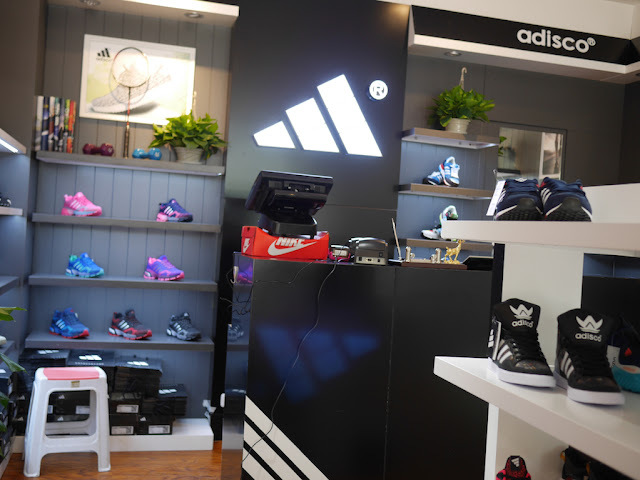 Many feature a three stripe design Adidas fans would quickly recognize. Two of the stripes are subtly divided into smaller sections, though. 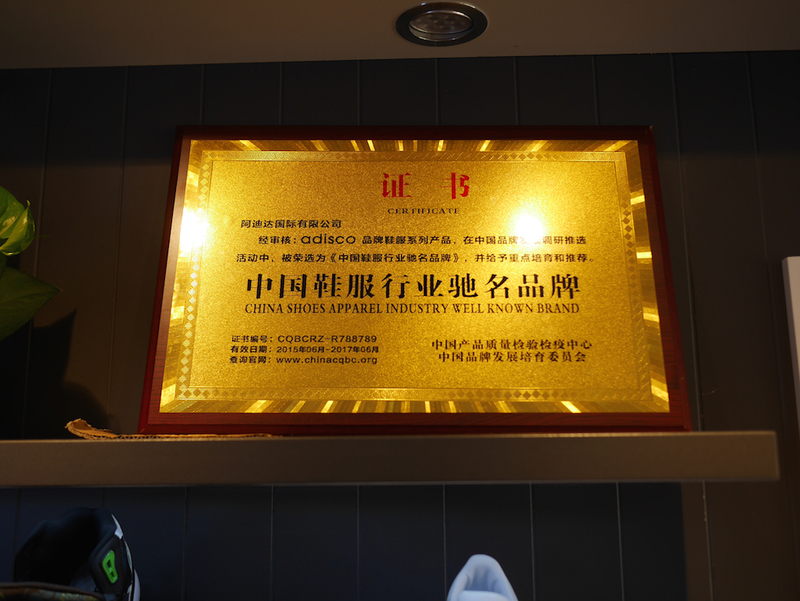 A shiny golden certificate in the store declares that Adisco is a "China Shoes Apparel Industry Well Known Brand". The certificate lists an official website for inquiries: www.chinacqbc.org. I have yet to find anything functional at that address, so I have not able to inquire about their standards. But the certificate's shininess is undeniable. Also undeniable is that the store was using a Nike shoebox. It seemed like an odd choice. Perhaps they were going for a "we're crushing Nike" message. Although there may be little doubt about Adisco's source of inspiration, I don't know if Adidas has challenged them or how Chinese courts would rule. 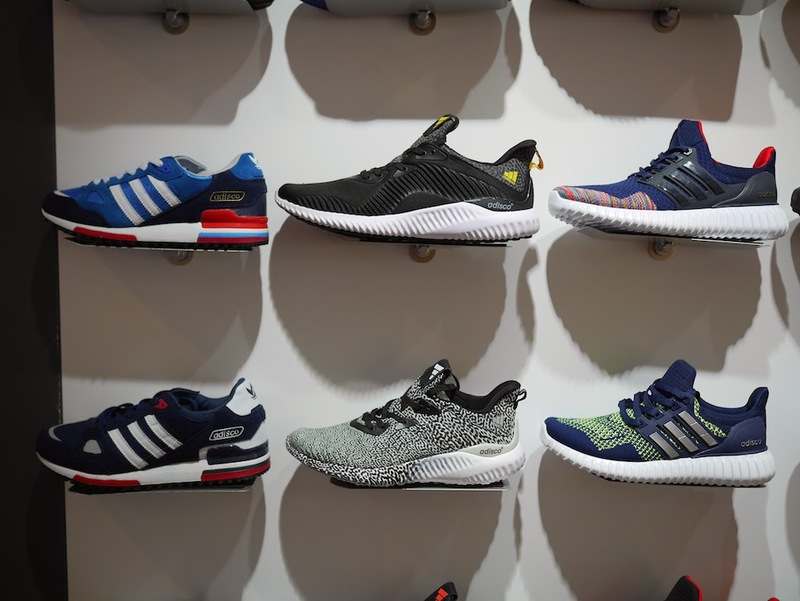 There are many relevant factors to consider, and the results of trademark disputes can be surprising. One of Adidas's competitors which appears on the first store's sign has run into much bigger trademark problems. More about that later. 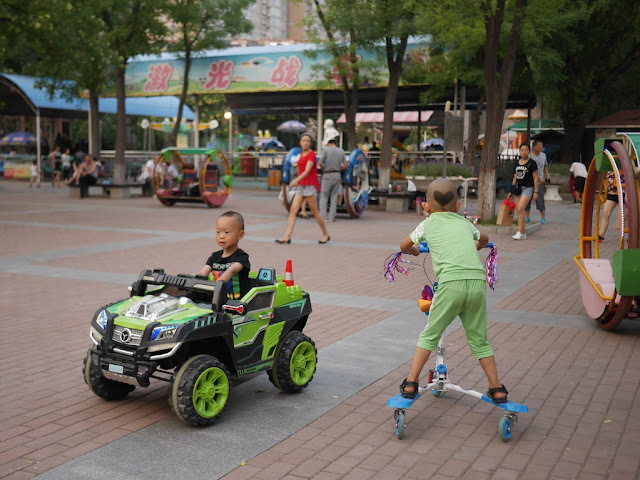 An advertisement for Jolin Tsai's concert wasn't the only example combining "play" and "chainsaws" I have seen in Taiyuan. Alongside Dong'an Road I watched a man shoot water at a little girl who defended herself with an umbrella. She also held a toy chainsaw. I am not sure of what she had in mind. I didn't see any disco balls around, but it looked like a good time. 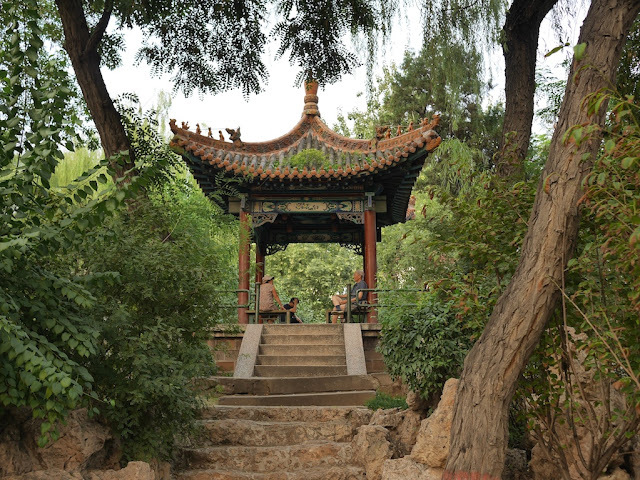 Although the pavilion was less secluded and didn't require as much of a climb, it reminded me of a xiangqi game under a pavilion in far-away Yangjiang. 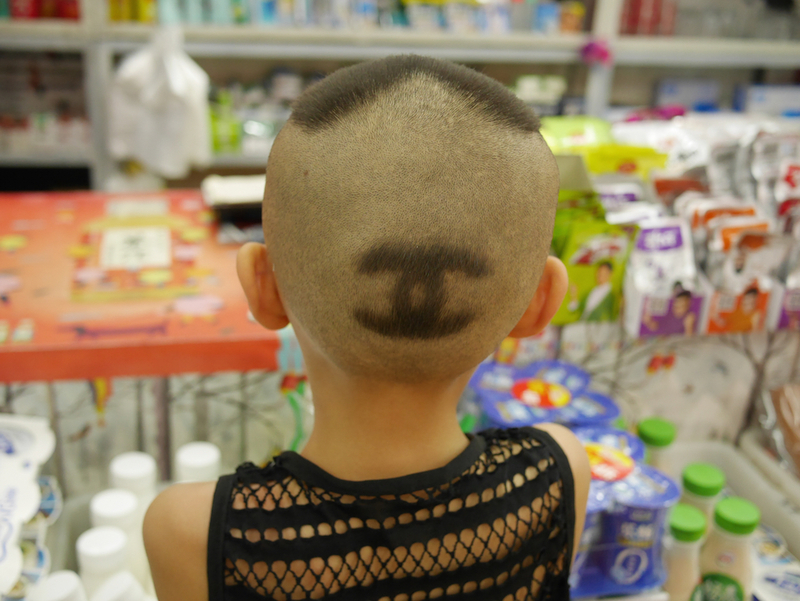 I think that is heart on the top of his head as well. 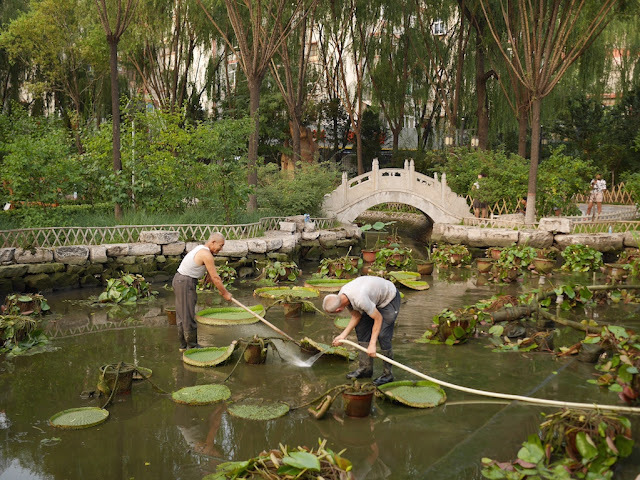 I saw the two men in the above photo working together to spray water underneath the large leaves of water lilies in the drained pond. The man with the hose also sprayed water at areas of the pond's bottom not covered by water lilies. I believe the genus of these large water lilies is Victoria but am not sure of the species. I can't find any information about caring for them that recommends draining a pond, expect for transplanting. The previous time I passed the pond, it was filled with water and contained similar, if not the same, floating water lilies. While it appears to be a cleaning of some sort, I am not sure what may have motivated it. 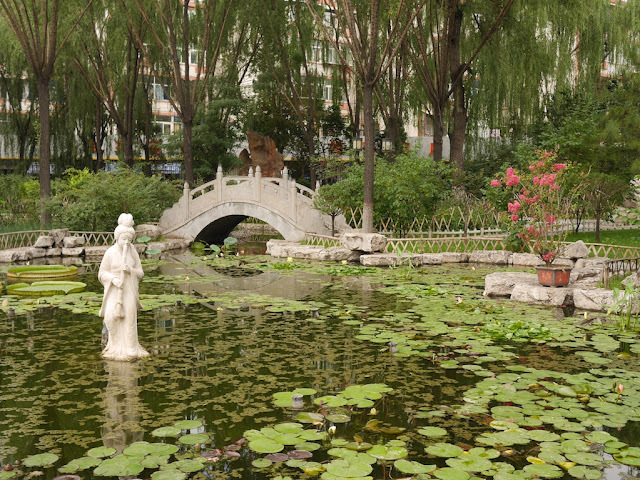 I would welcome any insights from water lily or pond aficionados. Most of today I was focused on non-lily matters. I welcomed the momentary diversion the water lilies provided both at the park and more recently while I learned a bit more about how to care for them. 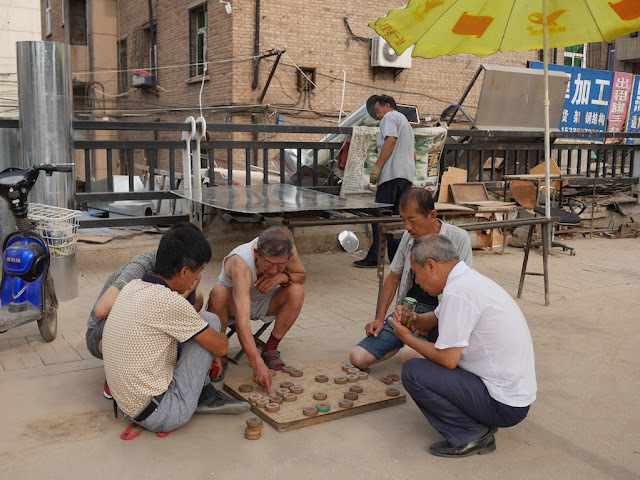 I have seen many people in China playing xiangqi outside, and often a crowd will gather to watch the two players match wits. 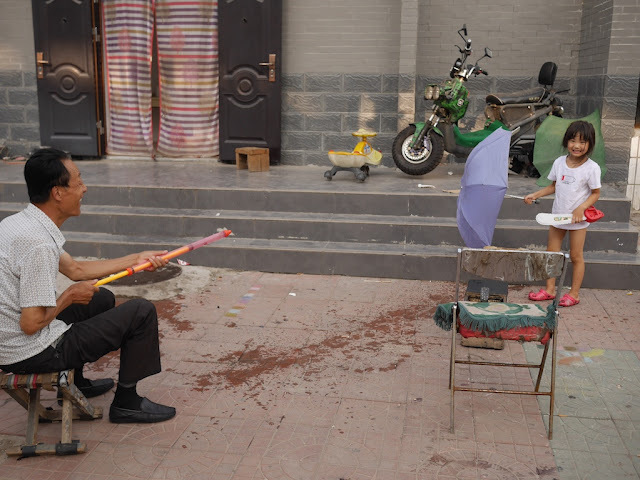 Onlookers aren't necessary for the game though, and this afternoon in Taiyuan I noticed that some don't even need a second player. I didn't try the donuts nearby. 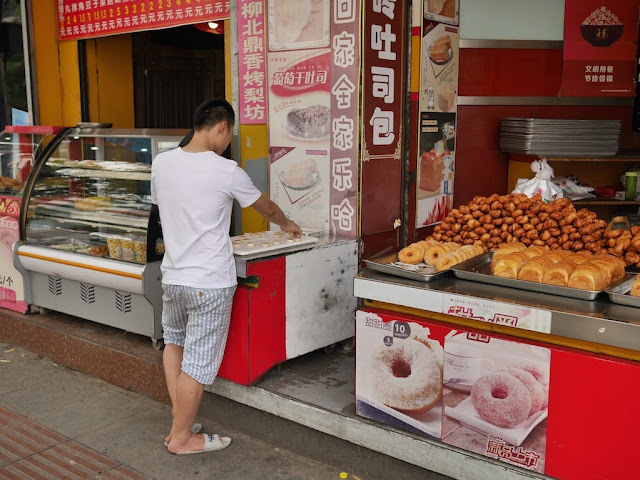 I will wait until I come across what I like to call Chinese donuts, otherwise known as xián jiānbing (咸煎饼) — something I won't miss whenever I am next in Guangzhou. Yesterday in Taiyuan I came across an opportunity to add to the xiangqi series of posts. These stark contrasts—an Internet that is simultaneously dynamic and lethargic, innovative and stultifying, liberating yet tightly controlled—are easier to understand when you realize they are not necessarily contradictions. 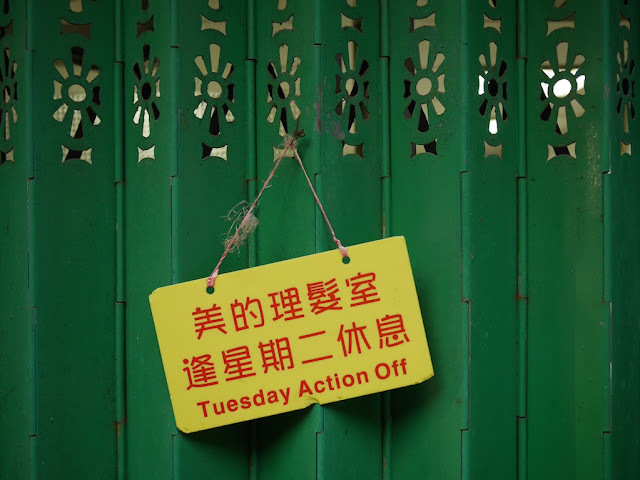 Being forbidden to develop tools for stimulating free expression or transparency essentially forces Chinese entrepreneurs to concentrate their resources on services that facilitate commerce, convenience, and entertainment. And the more successful those kinds of businesses become, the more money they and their investors have at stake, possibly cementing the status quo. 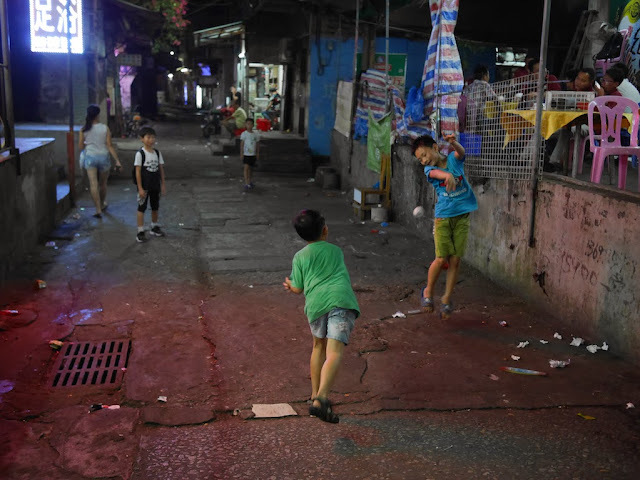 Recently, hundreds of Chinese investors, who may be out $6 billion in one of China’s biggest financial scams, have leaped over the Great Firewall in an organized, determined way. 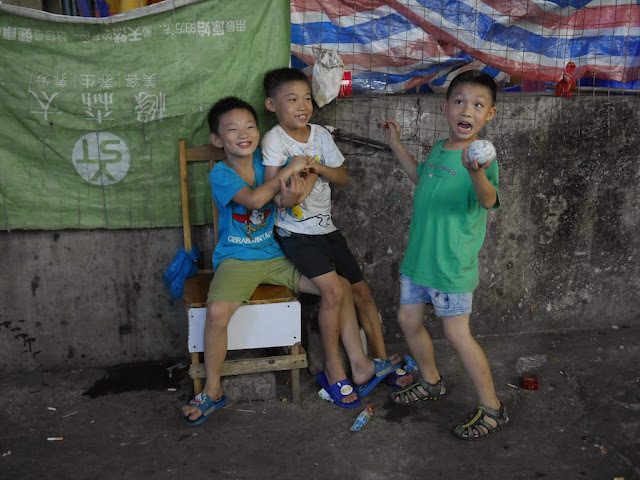 After being ignored by China’s regulators and lawmakers, these desperate investors are pouring into Twitter to spread news of their plight. Didi Chuxing, the dominant ride-hailing service in China, said it will acquire Uber Technologies Inc.’s operations in the country, ending a battle that has cost the two companies billions as they competed for customers and drivers. Didi will buy Uber’s brand, business and data in the country, the Chinese company said in a statement. Uber Technologies will receive 5.89 percent of the combined company with preferred equity interest equal to 17.7 percent of the economic benefits. 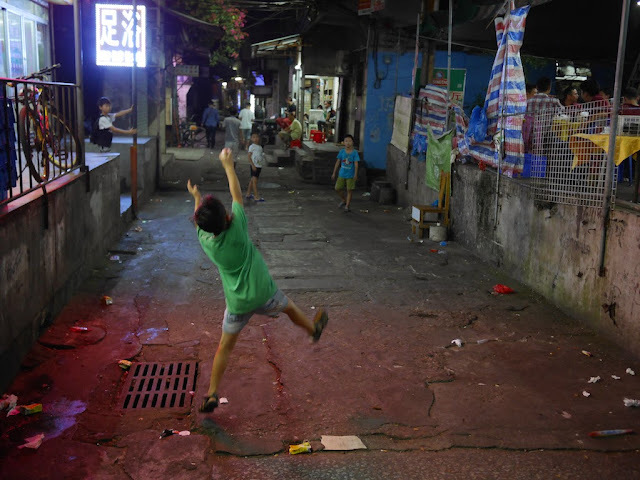 Then things got even worse—Beijing started to openly back Didi, with an investment by China’s sovereign wealth fund into the new Chinese giant. 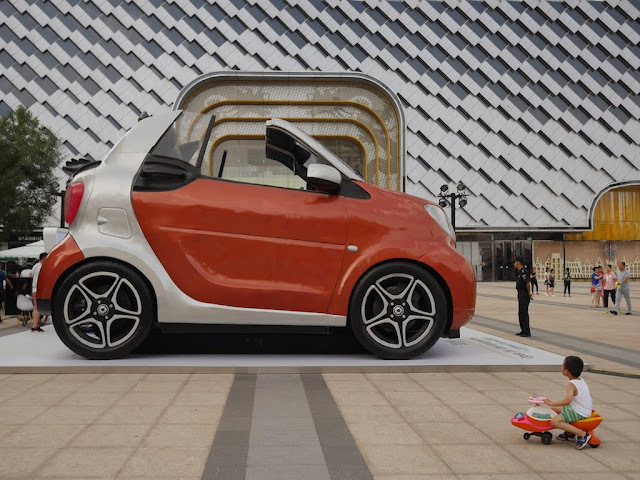 China’s state banks rolled out billions of dollars in loans to Didi. In August 2015, Uber reported it was being scrubbed from WeChat, a move, Quartz wrote, that was “almost certainly designed to protect and promote Didi Kuaidi” and make it hard for Uber to do business. Didi’s $1 billion investment in Uber likely gives it only a minuscule stake in the ride-hailing giant. But it nevertheless means it has its hands in every single one of its potential major competitors. This changes perceptions of the future of the ride-hailing industry.